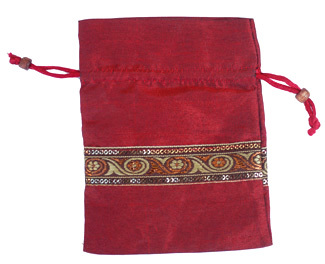 These beautiful little bags are made from a durable, shiny fabric and are adorned with an ornate embroidered band. 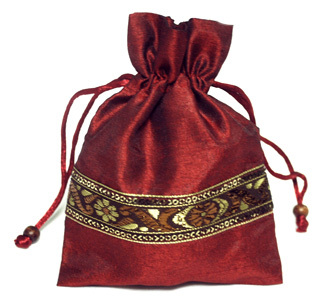 These beautiful little bags are made from a durable, shiny fabric and are adorned with an ornate embroidered band. 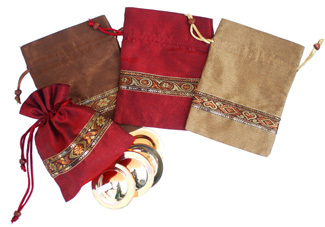 A perfect way to store and carry your finger cymbals or jewelry, or use as a special gift presentation. Much prettier in person than can be captured in a photo. 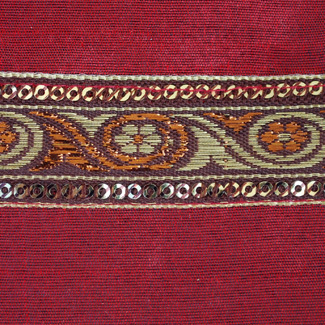 Total size: 6 inches high by 4.5 inches wide: usable is 4.25 inches high by 4.5 inches wide. Made in India. Really cute & good quality. It’s exactly what it looks like. Really awesome for the price.